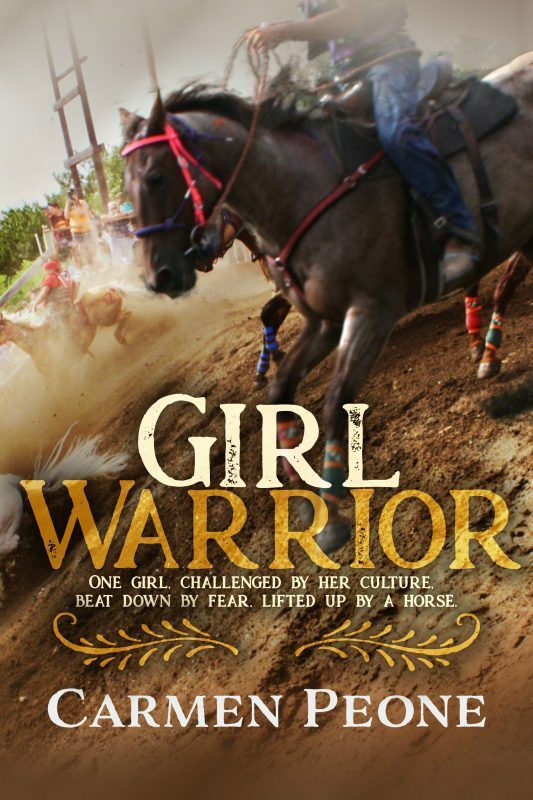 And for the cover, all I needed was one traditional Plateau Indian basket hat. How hard can that be right? 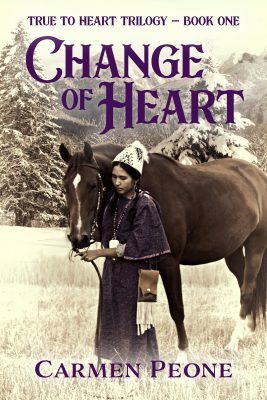 A couple of months ago, I went in search of the right cover for Change of Heart. After getting my rights back from my former publisher, I was eager to create the stunning cover I’d dreamed of. Then I could not find the “Just right” photo without months of emails and phone calls asking for permission. One such email I have had no reply to this day! Then a daughter-by-love hooked me up with a young gal from the Nselxcin (Okanogan) Language House in Inchelium, WA, on the Colville Reservation, where I live and write. How hard could this be, I asked? I’d known Brandon since birth and before he’d worked at the language house prior to moving near the Kalispell Reservation in Usk, WA. It took him two weeks to create the hat just for the photo shoot, delivering it a couple hours prior. As the only person in town, or that I know of, weaving traditional Plateau basket hats, he was more than willing to provide one. What a bonus. But here’s the real blessing. He made the hat just for the photo shoot and it now resides on top of the glass case that houses my Spupaleena doll which is perched in my office. Palouse Basket Hats, One for the live Spupaleena model, and one for the doll. The earlier materials used to weave basket hats were Indian hemp or dogbane. Once the settlers arrived, Native Americans switched to corn husks as they were easier to acquire. Today, modern materials such as hemp rope and alpaca wool are used. Some women bead their entire hat. It is said Inchelium used to have a huge hemp patch behind the Inchelium Community Church, which according to Brandon no longer exists. 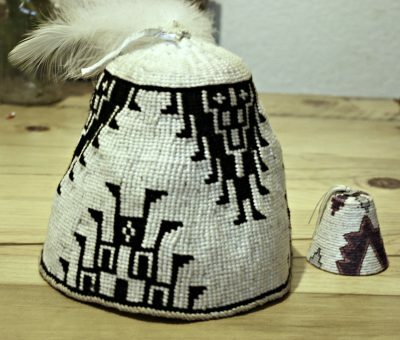 The basket hat is a traditional woman’s hat and is given as a gift. On the hat my cover model, Shayna Palmanteer, wears is the “flying geese” pattern. A common Plateau design that represents strength. Every year, geese make a long venture over treacherous mountain passes and are known for their strength because of the journey they take. When a woman wears the hat, it is said the strength of the geese transfer to her. Even the dark lines have a purpose. A black line circles the top and bottom of the hat indicating life and death. The woman’s strength lies between the two––her lifespan. In the old day, the hats were light brown or tannish and the design was dark brown. In contemporary times, the hats hold various hues. The strength of the hat and the geese matches Spupaleena’s drive to break through culture bounds and have the heart, courage, and passion to follow her dreams. The journey she believes her Creator sent her on. I hope we can all share her desire and drive in our own lives. 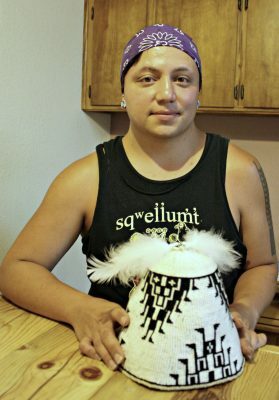 Brandon was raised on the Colville reservation and began beading at age 11. He makes his own drums, buckskin, beadwork, and basket hats. He learned and taught Nselxcin at the Inchelium Language House from 2014 to 2017. His devotion lies in keeping tradition and language alive. He sells his work mainly on the Powwow trail in Northeast Washington and enjoys gathering traditional foods and medicines. You can follow Brandon on Facebook. Beautiful cover and hat. What a wonderful gift Brandon Finley has and shares! Thank you, Nancy. A gift indeed! I’m incredibly thankful. Thanks for sharing. The basket hat is fascinating. Good luck with your series. Carmen, this is fascinating! What a work of heart. It fits into your theme so beautifully, too. BIG congratulations. Thank you, Mary! The best thing I’ve done/am doing is rewriting this book/series and putting it/them back out. I’m thrilled! Stunning post. Your writing is so instructional and grounded kin traditional values. The hat is the perfect touch. I love both the path your writing is taking and your total grasp of the culture you share. Your writing just gets better and better. Thank you, Anne! I appreciate your kind words. Isn’t growth exciting! Carmen, Kudos to you for going back to your Spupaleena series and giving the stories new depth and strength, and beautiful new covers. And what a joy that you could feature Brandon’s weaving work on this cover! He wove you a beautiful hat, and the meaning behind it gives me goosebumps. Congratulations! Thank you, Susan. This has been a huge blessing. Once my rights became mine, I was more than excited to revisit Spupaleena and like you said, add new depth and strength. What a journey! What an inspirational post. Everything is here – your solid research – your ample resources – and what promises to be a most intriguing story. Thank you, Judith. I think face to face research when available is key. I’m fortunate to live where I write. What a wonderful story about how your cover came about. And the cover is as beautiful as the story. Brandon is very talented to make such an awesome basket hat for your cover model. Extremely well done! I appreciate that, Brenda. Brandon is remarkable! Thank you for your kind words. I look forward to this book’s release. Your research is amazing. Your cover is beautiful. It’s the first page of your story – showing not telling. Carmen, I love how your reverence for all things Native shows through, not only in your actual writing, but also in your planning process prior to putting stories on paper. Is there no end to your energy and good works?! Can’t wait to see you at Walla Walla. Thank you, Betty. I appreciate your kind words. See you in Walla Walla. What a wonderful story behind the cover of your latest book, Carmen. Serendipity at its best that led you to your model and to Brandon, who has the gift of keeping alive his culture and making basket hats. I’m excited to learn more about this series! Thank you, Alice. I wholeheartedly agree. This is actually a rewrite of a series that is now out of print. The changes and improvements from when I first began my writing journey are exciting. I love to see growth in us all. I LOVE the new cover! Great story of its development, my friend. Thank you, Kelly! And there will be more about the model coming up! Carmen, I am so impressed with the attention to detail and authenticity in this new cover. The photo is absolutely stunning. Is this the first book in the series? Thank you, Brigid. It is the first book in the series. The photo session was so fun! I’m happy my photos turned out so well. How exciting. Love how everything is coming together for your book and cover. Thank you, Melody! This truly is a dream. The basket hat was the icing on the cake. Thank you, Melody. God is blessing!